I can't tell you how many times I scratched my head when I read a recipe out of "Around my French Table" some of the instructions just seemed, well foreign to me. I tried to keep an open mind. I do realize that this is a French cookbook and I know the French do many things differently than us Americans. I mean lets face it, all you have to do in the States is cover something in bacon or cheddar cheese and it's a hit in any American household. I'm not sure that would work as well in a French home, well maybe if the cheese was Gruyere? The Piperade Stir-fry is the first recipe that came to my mind when I thought of a new technique I learned from being part of French Fridays with Dorie. The recipe called for coating the peppers with red wine vinegar and sauteing them until they caramelized. The onions and garlic are not cooked. I was shocked at how intensely flavorful the peppers tasted. I have cooked other vegetables such as eggplant and zucchini with red wine vinegar on them too. The results were delicious. I would have never covered vegetables with vinegar... a surprisingly terrific techinque. I have grilled corn, boiled it and microwaved it. It all tastes pretty good. So when Dorie suggested roasting it in the oven for 40 minutes I rolled my eyes. Sure, I thought, I'll give it a try, but it's just going to be corn on the cob. Well, it wasn't. The corn kernels explode in your mouth with each bite. 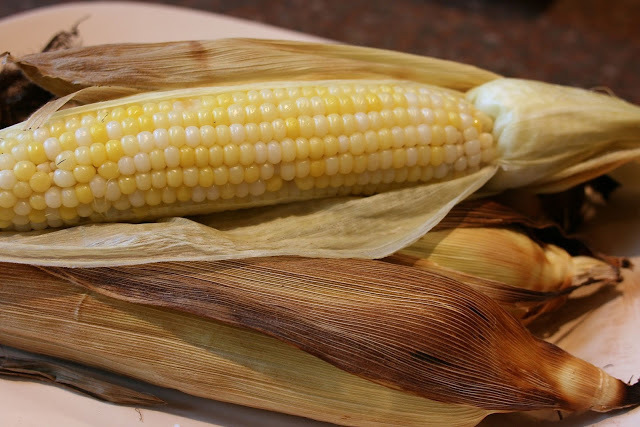 Roasting corn makes it incredibly succulent. To think this technique came from a French cookbook, a country that is fairly indifferent to corn... too funny. Needless to say, this is now how I make corn on the cob. I was originally disappointed with the Leeks Vinaigrette with Mimosa because I expected champagne to be involved in this dish. I had never made a salad with a root vegetable other than beets. Grating hard boiled eggs on to the leeks was also a revelation... really a beautifully simple and elegant dish. Everything about this Maraichere Quiche was odd to me. 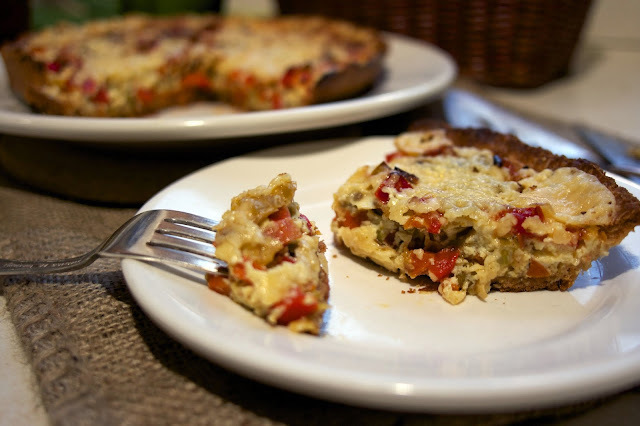 I had never made a quiche using all root vegetables, and I had never made a quiche that had little egg, with cheese melted on top instead of spread through out the pie! Well, my husband and I loved it. It was lighter than a regular cream heavy quiche and the cheese browned... which made it more flavorful and fun to eat... crisp cheese is heavenly in my book. This dish also opened my mind to not limiting my quiche ingredients... broccoli and peppers are not the only vegetables to put in a quiche. The concept of rillettes was really new to me. I never made spreads by blending fish or meat in a food processor with cream and seasoning. But wow... by processing the canned tuna and changing it's texture, it really became a different more interesting food. 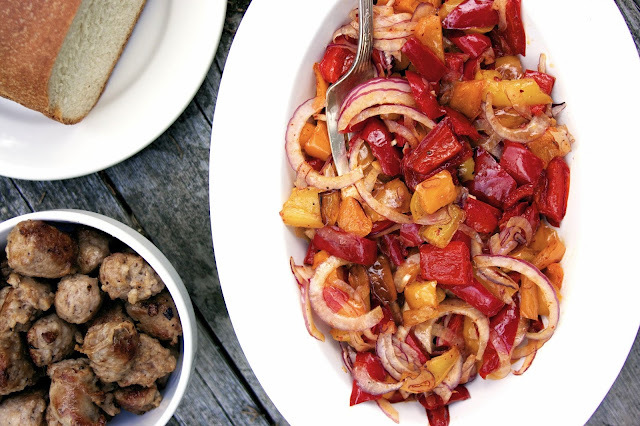 I love that you can whip this up out of your pantry. It makes a quick fancy appetizer for unexpected guests, and a really unusual tuna sandwich... much more exciting than the plain old mayo and celery version that we eat so often. I know lately I have been changing a lot of recipes because I really don't have the time or patience for fussy cooking, but I have been open to some of the cooking suggestions in this book, and I have learned some really enlightened cooking techniques from Around my French Table. Thank you Dorie! I remember thinking that roasting corn was odd - but it worked a treat! I almost didn't do it, but it really didn't take any real work so I tried it and was so happy that I did. Yes! The corn! That was a new method for me, too, and I loved it. I always over-boil corn and it gets soggy, so roasting it was the answer to my corn-related prayers. Not that I really have corn-related prayers. Anyway. The only problem I have with this recipe is that it makes the kitchen SO HOT. Especially in the summer, that's a turnoff. I love that quiche, too. I may need to make that one day soon. True about heating up the kitchen. We usually make the corn when we are in mountains so it's cool there most days... good point maybe more of a technique for late summer. Ditto on the corn and the rillettes...and the leeks. There are so many things I would never have tried on my own, but was so glad to have given them a shot. I was also shocked by how good the tuna rillettes were. I was never expecting not to like the dish, I like tuna well enough. But the taste and the texture were so different from anything which I was expecting. Great choice. I think the change in texture was key. Thanks for the reminder about the corn! It's such a treat done that way. I'm also a fan of the corn soup, too. I feel like we've all stretched our boundaries and expectations in this group, thanks to Dorie and her wonderful recipes. I don't remember a corn soup, but I do remember being surprised by the corn pancakes. The corn soup was delicious. Definitely give it a try - corn is a great foil to salty garnishes. Yes, we really have learned a LOT---I'm certain both my cooking and baking have improved thanks to Dorie. Interesting information- So many of my recipes are just spontaneous creations. I really should follow a cookbook to learn some new ideas. I too loved those leeks! I forgot!! 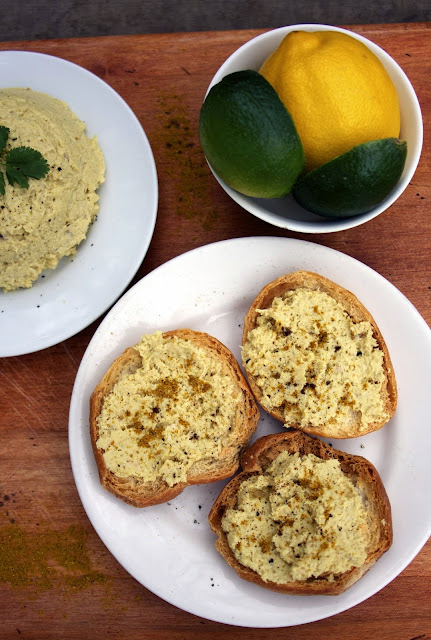 I've made a couple of versions of the rillettes that have been huge hits as well - new to me! What great selections, and interesting comments. Yep, that vinegar - that was good! Thanks for sharing. Lovely post!! I am loving this week. It's so fun to be reminded of so many great recipes. The rillettes were a pleasant surprise for me too, and those were my favorites. I bake pork chops in the oven, but never on peppers. I love the choices you picked and your photos are great. I loved all the food that you have mentioned in your post. I have made them all except the corn, I will have to try that one. You have some great selections, Diane! I think every vegetable is better roasted. What fun recipes to learn from! Those are great techniques to remember for the future! There is so much to learn from this book. It's been a real education from so many perspectives. For all your simplification of the book's instructions, I'm glad you took away some new tricks too! I also find it instructive to see how someone else does it, even when it reinforces my preference for the way I already do it. Such a fun series. 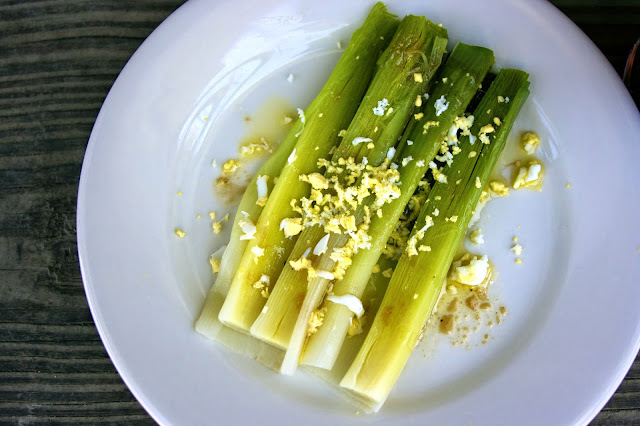 I need to try the leeks with the grated eggs, it just sounds fantastic. Thank you for sharing on Weekend Bites Diane. Looks like you learned lot nice techniques, thanks for sharing with Hearth and soul blog hop. pinning. Such great ideas! Looks great! Thank you so much for linking up at Tasty Tuesday! Your recipe has been pinned to the Tasty Tuesday Pinterest board! Please join us again this week! Great cooking techniques, Diane! Thanks so much for sharing your awesome recipe with Full Plate Thursday and come back real soon.